Xavier Rush has rejoined Cardiff Blues after league rivals Ulster agreed to release him from a two-year contract. The ex-New Zealand number eight agreed to join Ulster in February but a change in personal circumstances prompted a change of heart from the 32-year-old. "I would like to thank all parties concerned for their patience and understanding in this," said Rush. Ulster have signed South African international back-rower Pedrie Wannenburg, 29, on a two-year deal. "Ulster are a great team with a bright future," said Rush. "I was very impressed with the set up when I visited and I wish them the best of luck for the forthcoming season. "However, a change in my personal circumstances has resulted in me deciding to recommit with what has become my home from home, with the Cardiff Blues, where I am very happy. "I now just want to concentrate on having a good pre-season ahead of what promises to be another challenging, but hopefully successful campaign." Rush's previous Blues contract ran out at the end of last season after five years in south Wales. The former All Black is one of the form players in Europe and was a key figure last month as the Blues lifted the Amlin Challenge Cup with a 28-21 win over Toulon in Marseille. The Auckland-born number eight played a major part in two of the Blues' three tries in the Stade Velodrome, as they became the first Welsh side to win European silverware. 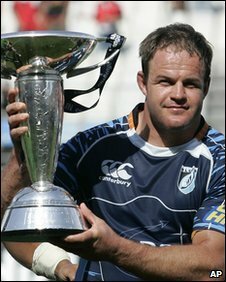 Rush signed from Auckland Blues in 2005, captaining the Welsh region for two seasons from 2006 before handing the reins to Paul Tito. Rush won eight All Black caps and captained Auckland Blues to the Super 12 title in 2003. "Xavier has played an integral part in our progress since joining the team in 2005," said Blues chief executive Robert Norster. "We are all obviously delighted that he has decided to re-sign and continue his impressive career with the Blues as we look to build on the success of last season."